This weekend I was doing a few minor repairs to my 1995 Audi S6 in preparation for Radwood next month. One of those involved replacing the 22-year-old self-dimming mirrors, which had discolored and separated a bit from their backing. I bought a set of European-style convex “blind spot” mirrors to fit for maximum rear visibility (and VAG-bro street cred). While the job was a simple five-minute in and out task, I was reminded that my car features a passenger’s side mirror that is much smaller than the driver’s side piece. I had to know more. Driver’s side on the left, passenger’s side on the other. 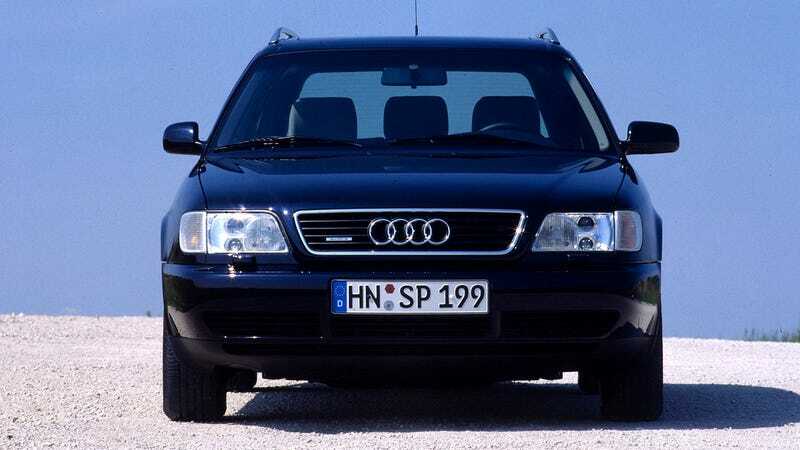 As it turns out, this was primarily a German mid-size and full-size sedan phenomenon in the mid-to-late 1990s. Volkswagen installed stubby mirrors on their Passat models, and Audi used the exact same set of mirrors as used on my car for nearly a decade on various sedan models. BMW did it, Mercedes did it. I assume Opel must have done it too, though I haven’t seen it in person. So what’s the reason behind it? It’s exactly as simple as you might think. These large cars take up a lot of room on Europe’s narrow streets, and narrowing the off-side mirror means a lower possibility of damage. Not only is the mirror less vulnerable to side-swiping parked cars that line the city streets, but it’s also less likely to be bumped into by pedestrians on the sidewalk when parked itself. Even still, these mirrors are fitted with hinges to fold away if something big and fast, like a cyclist, smashes into them. A late 1960s/early 1970s Audi. See, no side mirror! So, why did these weirdo mini-mirrors eventually go away? By the mid-2000s, the Europeans figured out that they could just equip their cars with power folding mirrors and not have to worry about the issue at all. It’s just a unique anachronism that I’ve always loved about my car, but now I know more about it. Hopefully you’ve learned something, too.